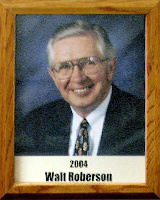 Walt comes to Tucson from Amarillo, Texas, where he played varsity baseball in 1948-50, ending his high school career as an all-conference pitcher. He attended the University of Arizona and played freshman baseball and was named varsity baseball manager from 1952-1954. An active bowler in Amarillo, where he once was named “Bowler of the Year,” he participated in league bowling since coming to Tucson and has been competing in it ever since. He joined the Tucson Bowling Association in 1962 and served on its Board of Directors for 41 years. He founded and sponsored the University of Arizona Bowling Club in 1982 and coached the team for two years after which he helped to supervise and raise funds for the next seven years. He is the only person in the history of bowling to have served as president of both national governing bodies of bowling – the American Bowling Congress (ABC) and the Young American Bowling Alliance (YABA). YABA is the national governing body for youth bowling. He was elected to the Tucson Bowling Hall of Fame in 1990. He has been active with USA Bowling, serving as the representative to the U.S. Olympic Committee. With USA Bowling, he helped them with fundraising activities, making Tucson one of the first and best cities in raising funds for USA Bowling. He has bowled in 37 Tucson Bowling Association Championships; 33 times in Arizona State Bowling Championships; and 28 American Bowling Congress championship tournaments.